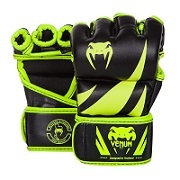 PROFESSIONAL BOXING EQUIPMENT, IRELAND'S LARGEST BOXING SUPPLIER, BOXING. 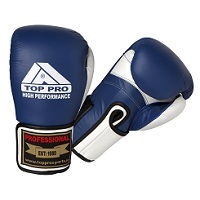 These SUPER PRO focus pads from Top Pro are made from 100% premium Cowhide Leather. They are super lightweight in construction and made to a the highest standard. 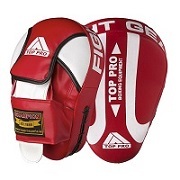 Used by some of the World's Best Pro's in the Boxing Business. They are shaped with high density foam padding along with 'G10SX' layered foam with a contoured wrist pad. With their adjustable pull on style with hook and loop closure for a secure and comfortable fit. * Made from 100% Premium Leather Hide. 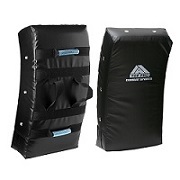 * Lightweight shaped high density foam padding. * G10SX' Layered foam with wrist contour pad. * Slip-on glove fitting for secure and comfort fit. * Double contrast stitching with tricolour design. 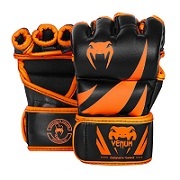 * Adjustable pull on with strong velcro closure. * 9" length hitting surface for better accuracy. * The Choice for Pro & Top Amateur Coaches.